The Lily’s Revenge is the epic nursery rhyme turned homo-rific, drag-tastic fairy tale of Lily, an ordinary houseplant, who undertakes to be more than what others make him to be. His is a delicious allegory/metaphor/cautionary tale/simile/hyperbole/paradox that spans 4+ hours of dance, drama and breakage of the 4th wall that warns never to settle for less than what you want. Even if that means shedding the skin of who you think you are to become who you are truly meant to be. This show is long, very long, so long that it prompts the anti-hero/narrator, Time (Samantha Eggers), to warn the audience against enduring it. Hers is a didactic lecture against the trappings of traditional theater performances. Also, it’s an honest suggestion that the infirm or those with mobility issues not stay as they might have difficulty entering and exiting the theater as often as is necessary. Go, she warns, before the story catches you in its grip and keeps you locked in nostalgia forever! No audience member listened and for good reason, the meat of the show is excellent. Lily (played by the full-throated, dashing Taylor Mac) begins his journey of self discovery from his flower-pot to life as a “real man” to marry The Bride who raised him. A life he eventually rejects. He finds that when he doesn’t love the man he’s become then it is impossible to love anyone else. He is thwarted by Curtain, a sort of satanic antagonist (Thomas Derrah) but aided by those around him. It is impossible not to adore Lily; he’s so damn sincere, but the entire cast is just wonderful. In 5 acts with 3 intermissions that include audience and cast interaction, food, live music and chair massage, “The Lily’s Revenge” is well worth the time devoted to the performance. Yes, it is a long show but the experience is well worth your time. During intermission, the crew and diverse cast go above and beyond the call of duty to ensure that everyone is having a good time. On stage, they reel you in and hold your attention captive. The Lily’s Revenge is a jewel among theatrical experiences. It is unlikely that you will ever experience anything like it in the Boston area. 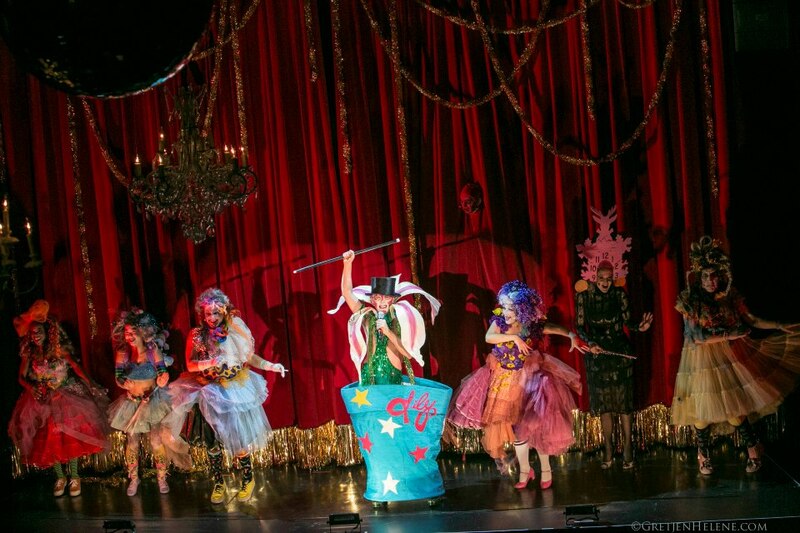 It combines opera, Shakespeare, puppetry, dance and drag pageantry (and so many other genres) into one cohesive, highly charged, well paced Spectacular that delves deep into the mind’s subconscious while providing a meta-theater experience. The lurid costumes that look like a Drag Queen’s wardrobe vomited glitter into the costume shop, the naughty dance numbers (This is not a child-friendly show. No one gets naked BUT at times they might as well be. Although some kids can handle that a lot of adults toting kids can’t) and group orgasms are all a “flower-gorey” for acceptance of LGBTQ community members in all aspects of life. It’s a beautiful sentiment: we’re here; we’re queer; please join us on stage. This entry was posted in Uncategorized and tagged 2012, American Repertory Theatre, Cambridge, Club Oberon, Dance, Drag Queen, drag-tastic, flower-gorey, glitter, homo-rific, LGBTQ, mobility issues, narrative, nostalgia, Oberon, October, opera, puppetry, Rachelle Garniez, Samantha Eggers, Shakespeare, Taylor Mac, The Lily’s Revenge, Thomas Derrah by Kitty Drexel. Bookmark the permalink.